Tourists are making a rush to get a glimpse of the Rosa Khutor ski resort, which will host several events at the Sochi Olympics. 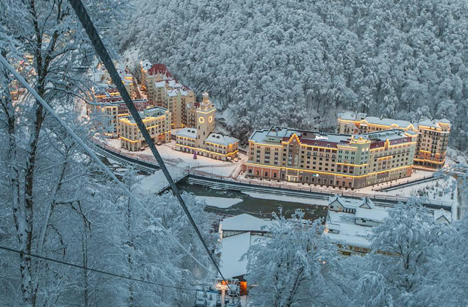 Heavy snowfall and unseasonably cold temperatures have warmed the hearts of the Rosa Khutor managers. “The heavens are with us,” Alexander Belokobylsky, executive director of the ski resort, said with a smile. “For us, it was the only source of uncertainty,” he explained while giving a tour of the resort to a group of journalists from Moscow. From the foot of the resort (Rosa Dolina, 560 meters) to the summit of Rosa Peak (2,320 meters), a thick coat of snow covers the slopes, ready to be streaked by thousands of skis and snowboards. To protect itself against the whims of Mother Nature, the resort got “the most powerful artificial snow system in Europe,” said Belokobylsky, indicating two 130,000 m3artificial lakes that will supply the countless snow cannons if they are needed. On the morning of Dec. 14, thousands of tourists rushed to take the gondola lifts. “We are at nearly 100 percent capacity for the whole week,” said Jean-Marc Farini, who has served for three years on behalf of Compagnie des Alpes as general manager of the resort’s slopes. Noting that “today there is more snow here than in the Alps,” Farini pays particular attention to the resort’s commercial success and consequently to the services it offers its clientele. The target audience is essentially Russian. “They don’t need a visa, and everyone here speaks Russian,” unlike at the European resorts, where until now, wealthy Russian skiers have focused on. So far, impressions of the first tourists have been positive. Because of to the Olympics, the tourist season will be short. From Feb. 7 through March 17, Rosa Khutor is reserving its trails for athletes. “The area won’t be completely open until next winter, with more than 100 kilometers of trails marked out,” Farini said. And the foreigners? Farini remains cautious. “I think we’ll be able to attract some curious people, those who have skied on all the European trails and want to see something new. Foreign skiers who ski a lot will want to try it at least once in their life.” He said he believes the clientele will be 80 percent Russian. “I don’t think this will decrease the number of Russians who go to Europe,” he said. The number of Russian skiers is actually projected to jump in the coming years, thanks in large part to the popularity of the Sochi Games. In terms of price, Rosa Khutor is aiming at the middle class with lodging-skiing combination deals to rival those of French resorts in the same range. The extension of the skiable area to the neighboring resorts (Laura, Alpika Service and Mountain Carousel) should make the deal even more enticing, but negotiations are just starting. Compagnie des Alpes also would like to offer free admission at Rosa Khutor to people who hold tickets to the Savoy resorts it operates, and vice versa. “It’s a marketing stunt more than anything,” said Farini, who above all would like to talk about Compagnie des Alpes’ first major international venture. The Caucasian resort has indisputable assets: spread over a North slope, it offers fresh snow, which is also due to the nearby Black Sea. The view from the top is breathtaking. There are runs of widely differing levels, all the way up to two black trails with 68 and 69 percent “walls.” Connoisseurs will appreciate this, while others will cast terrified looks and continue on their way. On this inaugural day, the French manager methodically inspects the trails and ski lifts, flagging down employees as soon as he sees something that displeases him. There remain a few adjustments to be made in order to be first class (presale of tickets, orderliness in the waiting lines, assortment of refreshment areas at the top), but the Caucasus is now firmly on the map for the most demanding ski enthusiasts.